Asbestos cement siding is very common in older homes as it was used widely due to its durability and resistance to fire. Asbestos cement siding was a commonly used building material in the US and Canada from the early to mid/late 20th century (roughly from the 1920s to the 1980s). The EPA officially banned the use of asbestos in new building materials in 1989 but decades of use means it is still in millions of homes. Asbestos siding was manufactured by adding asbestos fibers (which are a naturally occurring mineral) to Portland cement. The resulting combination was then formed into a variety of siding shingle sizes, profiles, and textures and allowed to harden. Asbestos cement siding was a popular siding material as it was relatively inexpensive to make and was very durable. Why Use Asbestos Cement Siding? Unlike wood siding, asbestos cement siding was impervious to weather, termites, and rot, and the addition of asbestos made the siding very fireproof and durable. It’s not uncommon to find 70 year old asbestos siding still on the exterior of homes that is in perfect condition, completely unharmed by the passage of time. The problem with asbestos cement siding is that it was discovered that inhaling airborne asbestos fibers can cause mesothelioma, asbestosis, and other lung damage. If there’s any good news concerning asbestos cement siding, it’s that it is one of the more inert and safe forms of asbestos containing materials that you’ll find. Cement siding may crack over time but in order for the fibers to become airborne and dangerous, pieces of siding must be broken into very small pieces or sawed continuously. Cement siding is also one of the easiest forms of asbestos to remove, and one of the few instances in which a homeowner can safely remove asbestos themselves if proper precautions and safety tips are followed. 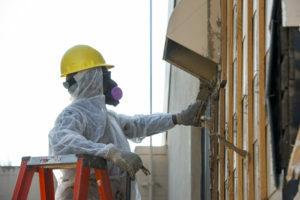 As long as each piece of siding is removed intact and not broken — and immediately bagged up properly — it’s difficult to release dangerous asbestos fibers. The fact that siding is installed outdoors and is easily accessible also makes the job easier and less costly, even if you hire a licensed asbestos removal and remediation company. The durability of asbestos cement siding also means that some homeowners choose to keep the siding on their homes. You can replace any loose or cracked pieces of siding with newer asbestos-free siding manufactured by companies such as GAF to match the style of older asbestos siding. Some states allow asbestos siding to be disposed of in landfills, while others require that it be treated like a hazardous material with special regulations to follow. As with many asbestos issues, be sure to do research and check your own local and state laws that may govern issues such as removing asbestos cement siding or any other material containing asbestos. Older asbestos siding can also be painted or covered or encapsulated by adding newer siding on top, so be sure to consider all your options when dealing with asbestos cement siding on your home. There’s no way to tell simply from looking at siding to know if it contains asbestos or not. Older siding shingles may have the distinctive scalloped edges and “look” of asbestos siding but not all older cement siding had asbestos added to it during the manufacturing process. The only way to know if you even have an issue with asbestos is to have any questionable material tested by a lab.